The Ruckelshaus Institute completed its involvement with the Wyoming Public Lands Initiative in September 2018. Institute faculty and staff were assisting three WPLI advisory committees in Carbon, Sublette, and Teton Counties through their deliberations. The Carbon County WPLI Advisory Committee reached a consensus recommendation for three of the four Wilderness Study Areas (WSAs) within their purview. The Carbon County Board of Commissioners voted to accept the recommendations of the advisory committee. 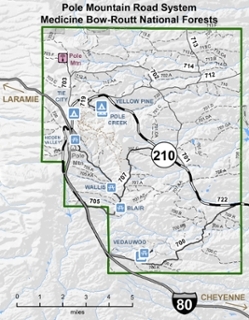 The Sublette County WPLI Advisory Committee could not reach agreement on final designation of the three Wilderness Study Areas in that county. In May 2018, they forwarded three separate recommendations for the Sublette County Board of Commissioners to consider. The Commission chose not to adopt any of the three. The Teton County WPLI Advisory Committee was also unable to find a comprehensive solution that satisfied the interests of the 19 interest groups represented on that committee. In July 2018, the Advisory Committee forwarded three separate recommendations to the Teton Board of Commissioners each representing the desires of different stakeholder groups. The Commissioners voted to accept the one management prescription that was acceptable to all parties, which was to exempt energy development from all federally managed lands in the county. 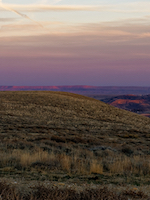 Carbon County and Teton County forwarded their recommendations to the Wyoming County Commissioners Association for inclusion in a public lands bill to eventually be considered by Congress. 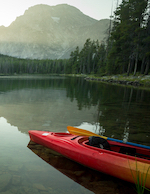 In 2016, Wyoming Governor Matt Mead created the Outdoor Recreation Task Force to assess the state's outdoor recreation sector, its needs for the future, relationships with land access, and possible creation of an Office of Outdoor Recreation. The Ruckelshaus Institute's Jessica Western facilitated the 26-member group, guiding discussions, organzing information and presentations, and providing decision-making assistance. Together, the group developed 11 recommendations for the Governor's consideration. 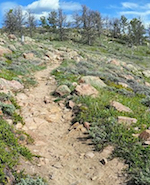 In the summer of 2016, the Ruckelshaus Institute helped Wyoming Pathways and local trail advocates gather public input on non-motorized trails in the Pole Mountain area of the Medicine Bow National Forest. The groups held a public charrette, an intensive planning session where people collaborate on a shared vision, and solicited comments via social media, email, an interactive online map, and other formats. 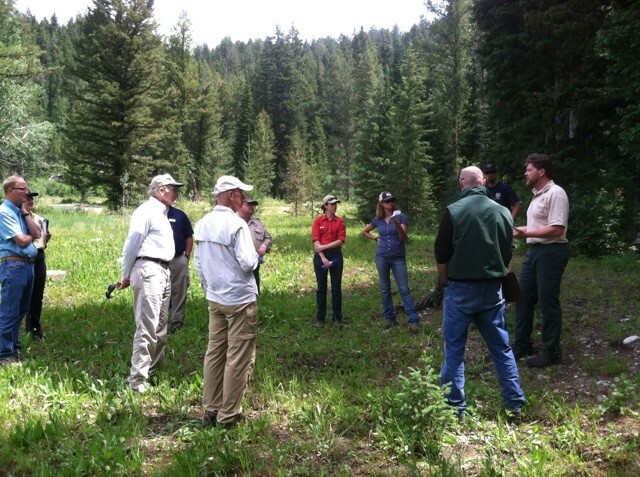 In spring of 2016, the Ruckelshaus Institute convened three Thunder Basin Collaborative Learning Workshops on behalf of the U.S. Forest Service to engage stakeholders, to ensure that all parties are working from the same information, and to lay groundwork for future informed decision making about grasslands management. 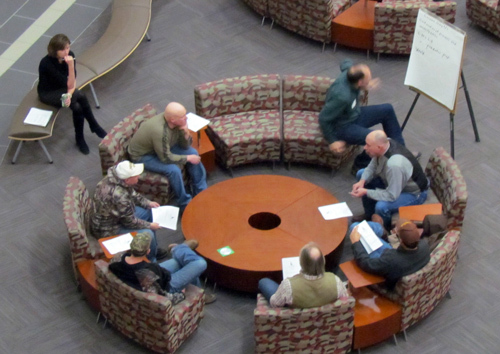 The workshops brought together the people who live in, have a direct interest in, or somehow use the Thunder Basin National Grassland to discuss the past, present, and future of the grasslands. In October 2014, the Laramie County Commissioners created the Laramie County Control Area Steering Committee, and hired the Ruckelshaus Institute to facilitate the group’s meetings. In March 2016 the Steering Committee produced a Control Area Groundwater Management Plan, which contains recommendations on well spacing and static water level reporting, and the basic components of a financial incentives program for reducing groundwater consumption. Governor Matt Mead created a Task Force on Forests in 2013 to study the benefits forests provide and to analyze and consider new response strategies and recommendations for both active and passive management. 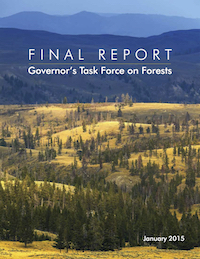 With leadership from the Ruckelshaus Institute’s Collaborative Solutions Program, the Task Force on Forests reached consensus on 12 major recommendations comprising 53 sub-recommendations for the Governor’s consideration. In 2015, the Medicine Bow National Forest began preparing to update the road system on Pole Mountain, a unit of the forest between Laramie and Cheyenne. They asked the Ruckelshaus Institute to help solicit public input to inform their proposed updates. We did this by organizing four public meetings, soliciting comments via email and social media outreach, creating an interactive website where members of the public could leave comments, and producing five short videos of Forest Service staff explaining the road system. We presented the over 300 comments to the Forest Service in the form of a final report and GIS layers. In response to a request from the Greater Yellowstone Coordinating Committee (GYCC), the Ruckelshaus Institute designed and facilitated a series of public listening sessions in Jackson, Wyoming; Bozeman, Montana; and Cody, Wyoming, in 2014-15. The goals were to improve existing relationships and create new relationships between the GYCC and stakeholders, to enhance the management effectiveness of the GYCC on ecosystem-scale issues, and to focus national attention on the issues, solutions, importance, and function of the Greater Yellowstone Ecosystem. 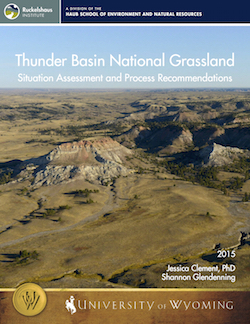 In 2015, the Medicine Bow-Routt National Forests and Thunder Basin National Grassland, a unit of the U.S. Forest Service, approached the University of Wyoming Ruckelshaus Institute to ask for assistance exploring stakeholder perspectives regarding prairie dog issues and the possibility for engaging in a collaborative process on the Thunder Basin National Grassland. The Ruckelshaus Institute Collaborative Solutions Program conducted a situation assessment to determine whether collaborative problem solving was an appropriate approach to inform decision making for this issue. 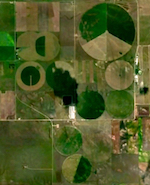 The Ruckelshaus Institute hosted a workshop and conference on place-based collaboration to connect communities with natural resources and the environment in Casper, Wyoming, in September 2014. Keynote speakers and concurrent sessions emphasized using collaboration to address natural resource challenges related to forests, wildlife, and oil-and-gas development. In 2008 the U.S. Forest Service updated its National Environmental Policy Act (NEPA) procedures to permit a more iterative approach that facilitates collaborative public engagement. Iterative NEPA, or iNEPA, allows practitioners to incrementally improve proposed actions and alternatives to meet stakeholder interests. In 2014, this workshop brought together experienced NEPA practitioners to discuss integrating iNEPA into agency practice. 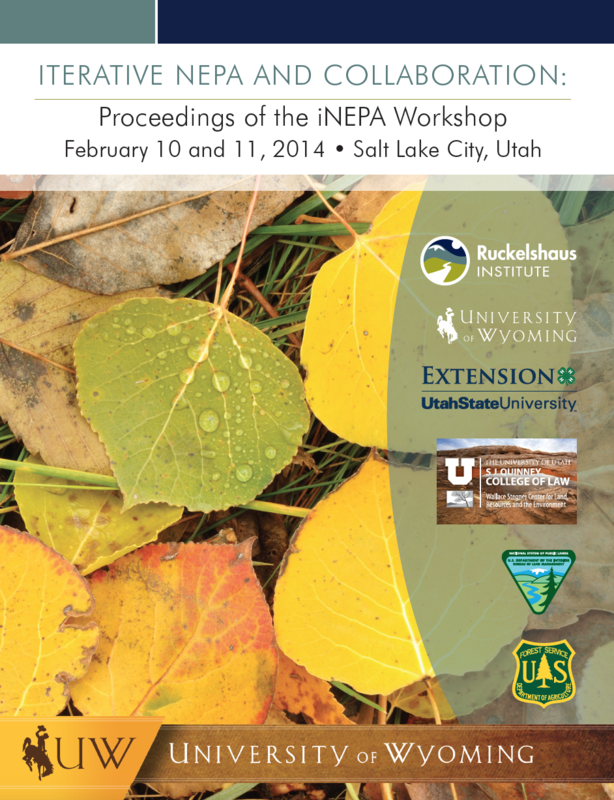 The document outlines iNEPA, its legal foundations, collaborative approaches to the process, and opportunities and challenges related to iNEPA. Teton Canyon in the Caribou-Targhee National Forest is treasured for its scenic values, recreation amenities, and abundant wildlife, but 100 years of fire exclusion has resulted in dense stands of timber, high loads of dead fuel on the forest floor, increased tree mortality, and unproductive wildlife habitat. The Teton Basin Ranger District proposed vegetation treatments and prescribed fire to reduce fuel loadings and create a more natural vegetative mosaic. 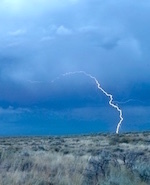 The proposal generated significant public interest. In 2014 the Ruckelshaus Institute was asked to help convene public meetings to hear forest users’ concerns, gather information about what people value in the canyon, and learn what they might want to see the Forest Service do to improve conditions in the canyon. Concerns about rampant wildlife mortality on roads in the Greater Yellowstone Ecosystem brought diverse stakeholders together. 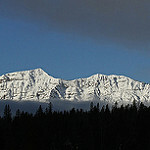 By 2013 much had been achieved, such as new signs and new wildlife crossing structures near Daniel Junction. To keep these efforts moving forward, the Ruckelshaus Institute was invited to facilitate strategy meetings, which evolved into the Safe Wildlife Crossings Collaborative, a citizen-led effort now incorporated into three non-profits and two local government entities. The Jackson Hole Conservation Alliance, the Greater Yellowstone Coalition, the Jackson Hole Wildlife Foundation, the Teton County Board of Commissioners, and the Teton Conservation District all assumed strategic plan objectives developed at these meetings. 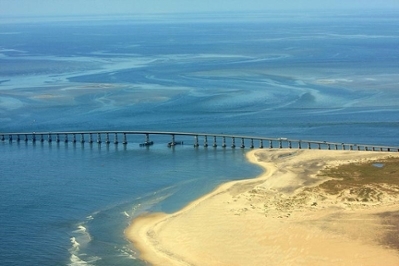 In 2013 Dare County, North Carolina, sought to explore the feasibility of using a collaborative, science-based, stakeholder driven process to determine a solution to maintaining a safe navigable route through Oregon Inlet while also protecting the natural landscape of the Outer Banks. The county requested assistance from the Ruckelshaus Institute to conduct a stakeholder assessment. The purpose of the assessment was to evaluate whether this issue is amenable to collaborative problem solving. In 2013, this forum brought together professionals interested in participating in or leading natural resource collaborative efforts in Wyoming to discuss lessons learned from past and present collaborative efforts, identify barriers and opportunities, and explore the needs to facilitate future efforts. In 2012 the Ruckelshaus Institute facilitated meetings of the Upper Green River Basin Citizens Advisory Air Quality Task Force, which submitted a set of consensus recommendations to the Wyoming Department of Environmental Quality to address elevated ozone levels in the Upper Green River Basin. 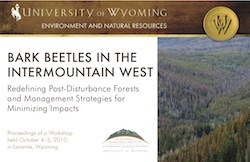 In 2010, the Ruckelshaus Institute convened forest managers, scientists, and researchers from across the Intermountain West for a hands-on, two-day policy workshop on bark beetle infested forests to develop new ideas for post-epidemic forest conditions. The report generated from the workshop documents the recommendations and discussions to guide future management efforts. 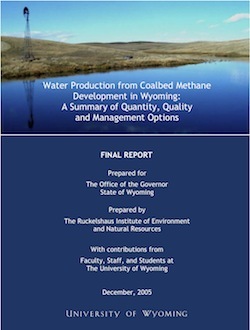 The Coalbed Methane Produced Water Working Group was convened in December 2009 by the Wyoming Department of Environmental Quality (DEQ). The group’s mandate was to assist in the development of a CBM permitting strategy in a way that recognizes the serious and substantial interests of landowners, industry, and the state of Wyoming so that statutory water quality standards could be met. The Ruckelshaus Institute designed, organized, and facilitated the Working Group deliberation process. 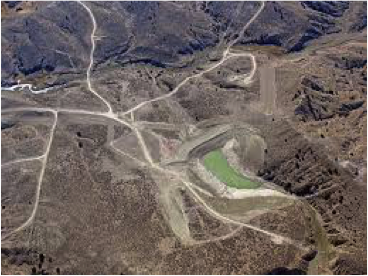 In 2005 the Ruckelshaus Institute assisted the Wyoming Department of Environmental Quality (DEQ) in a stakeholder-driven process for developing a new permitting strategy for coalbed methane (CBM) produced water discharges in the Powder River Basin. The CBM Produced Water Working Group was composed of landowners, industry representatives, members of the conservation community, and agency personnel. Through a decision-aiding process, the group was able to successfully develop a suite of recommendations to the DEQ for its revised CBM product water discharge permitting policy. The Ruckelshaus Institute convened stakeholders to address winter recreation in the Medicine Bow-Routt National Forests. A working group with 29 forest users generated management recommendations to increase recreational opportunities for winter users. A final report and recommendations led to an education initiative with new signage and maps, a collaborative grooming plan, new parking lot rules, as well as a Forest Service host program and volunteers for monitoring and recording winter use. 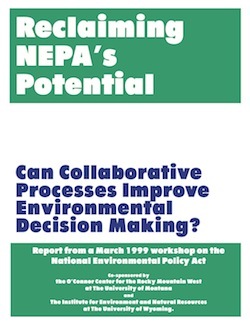 In 1999, the Ruckelshaus Institute, with the Center for the Rocky Mountain West, co-hosted a national workshop commissioned by the President's Council on Environmental Quality (CEQ) on reclaiming NEPA'S potential. Participants included experts from government, industry, environmental organizations, and academia. The workshop led to recommendations to CEQ for improving NEPA implementation through application of collaborative processes.